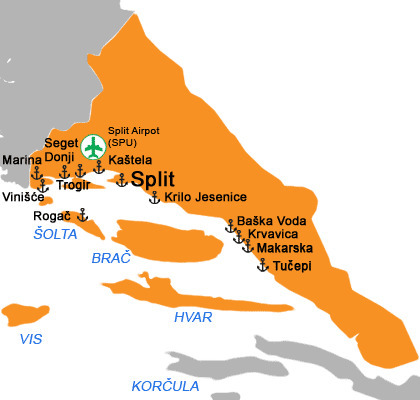 Split (Central Dalmatia) extends from Trogir, over Kastela and all the way to Makarska on the mainland, also some of the most beautiful islands make an integral part of this area; Brac, Hvar, Korcula and Vis. The city of Split, which is center of Split region lies on a peninsula between the eastern part of the Gulf of Kastela and the Split Channel and is one of the hottest cities on the Adriatic coast. Due to its excellent connection to all middle Dalmatian islands, Split is the best place to start day trips also by different types of transport. In Split there is also airport, bus station and being the largest port in Dalmatia, excellent connection by land and sea is guaranteed. Trogir Riviera has many coves, bays and capes, you can visit rocky and sandy beaches in the bay of Stari Trogira and also the bay Saldun, Racetinovac and Kancelirovac, located on the west side of Ciovo. Makarska Riviera is located at the bottom of Mt Biokovo in a long cove, surrounded by real mediterranean vegetation and by numerous camps. The island of Brac is well connected by ferry and boat lines. The most famous tourist place is Bol with a beautiful sandy beach Zlatni Rat. The famous tourist places are also Supetar and Pucisca. Great climate, rich vegetation and beautiful beaches are a great challenge for all the guests who gladly and regularly visit this beautiful island, a real tourist paradise. The most famous island, island of Hvar is very well known for the most sunny days per year and widely acclaimed healing climate especially for asthmatics. Solta Island is a small island not far from Split, with numerous small bays suitable for swimming. Beach in Nečujam is the largest on the island and offers numerous sporting facilities and is ideal for family holidays. For those guests who actively spend their holidays island of Vis offers a variety of sport activities and many excursions. Vis is also well known for clean and beautiful sea, numerous bays, pebble and sandy beaches, hidden bays - real oasis of peace and perhaps the greatest value of the island.